It was a scorching hot Friday (25 March) that marked the beginning of the 4-day Durban Ratha Yatra Festival 2016. I attended the festival for the first time and had been looking forward to it for a long time. 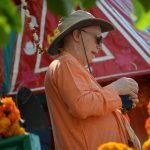 Kadamba Kanana Swami made a brief appearance at the festival on day one. 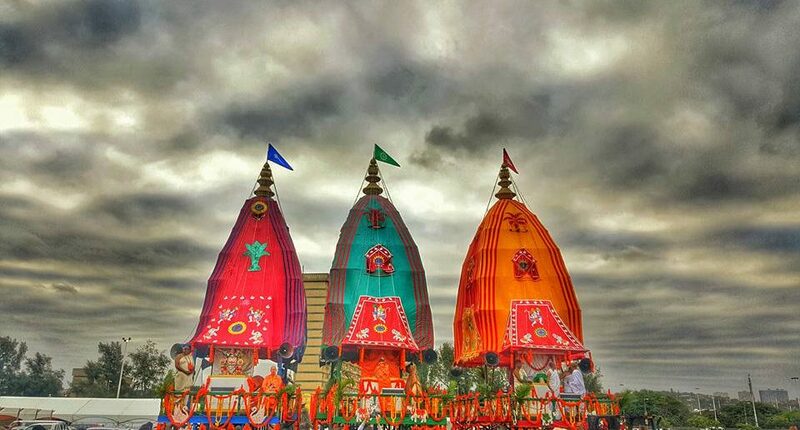 When we arrived at the site where the three chariots stood, in the middle of the city, hundreds of people had gathered already and were eagerly awaiting the arrival of Their Lordships. 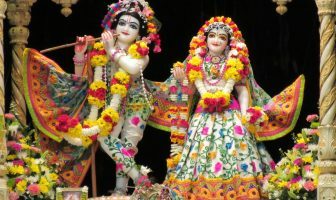 Maharaj started kirtan and after some time, devotees began dancing wildly even though the procession was not yet underway. Shortly thereafter, Their Lordships arrived and were raised by a forklift onto the chariots. 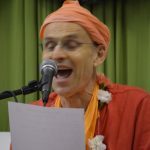 Bhakti Caitanya Swami gave the opening speech from Lord Baladev’s chariot, announcing that it was the 28th annual Durban Ratha Yatra Festival! After an offering of aarti and coconuts, the procession began. 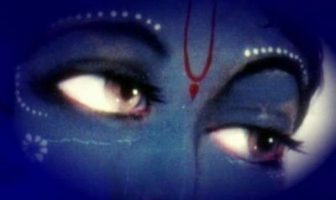 At this stage, Kadamba Kanana Swami took leave of everyone and returned to the temple. 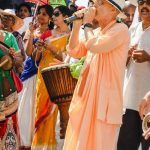 There were other wonderful kirtan leaders, like Bhakti Marg Swami and Agnidev Prabhu, singing during the procession which lasted about three hours. On the way to the festival site everyone was in an ecstatic mood. There were about twenty tents built up at the site, each one offering different means of spiritual entertainment e.g. 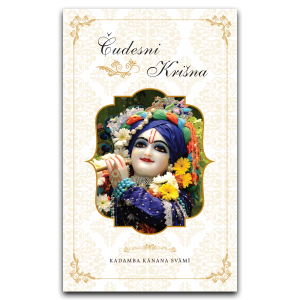 prasadam, clothing, kirtan, books, etc. One tent supplied constant background music and the main stage featured many exciting performances such as: dances, yoga, spiritual lectures and of course a daily drama, which was one of the highlights. Bhakti Marg Swami had quickly trained up a group of devotees to perform in two plays that were featured over the four days. 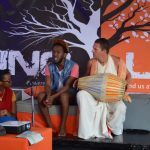 The Bhakti Cloud tent was designed for young people and it featured some really good singers and talented poets. In front of the Food for Life tent, there seemed to be a never ending queue as free prasadam was distributed throughout the festival. 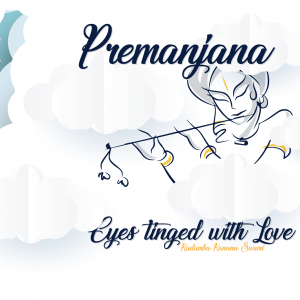 Kadamba Kanana Swami had three Question and Answer sessions scheduled over the weekend and each time the tent was packed as people were so eager to see and hear from him. 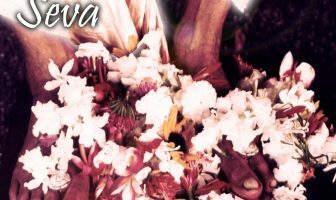 On Saturday, Maharaj spoke about the true meaning of charity, explaining that we should give everything for Krsna and not only what we possess but we should give our LIVES as this is the greatest charity of all. Another topic he spoke on was goodness, passion and ignorance. Maharaj mentioned the tight rope of spiritual life and the safety net of goodness, which is an analogy that shows how the rules and regulations of goodness actually prevent us from falling down. On Sunday evening, Maharaj led kirtan in the Jagannath Mandir tent and it became so ecstatic at one point that nobody was sitting down anymore but everybody was dancing. On the last day of the festival, a second chariot procession took place in the evening. 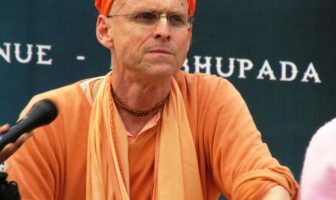 Kadamba Kanana Swami made only a short appearance to pay obeisances to Lord Jagannath and speak to a few people before leaving the site again. 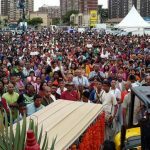 On Tuesday morning, many devotees who had travelled from all over South Africa started their journey back to their respective homes and Durban temple, which was a hub of activity for over a week, quietened down again.